Imagine a welcomed visit from an old acquaintance and their much loved Fido. You spend the day reminiscing about the old days and catching up on old times. Spot and Fido hit it off marvelously. They scamper and play the day away as if they too were old chums. But when the day is done, Spot has an un-welcomed reminder of the day. You notice him chewing and scratching feverishly. He fidgets in his favorite pet bed. He is restless through the night. In the coming days he begins to develop bare spots and sores. What could it be? Is he allergic to his pet bed? Did he have a reaction to the grass from romping the day away? No. It’s the ever-dreaded flea infestation. Unfortunately, this scenario is all-too common. You spend your time dutifully keeping up with the responsibility of Spot’s flea prevention only to find that those pesky little critters have snuck in through the back door. Though it is best to take preventative measures to keep them out in the first place, once they are in you must take action. And once they’ve begun breeding in the deep dark recesses of your home, you’re in for a real battle. You think you’ve beaten them. But they won’t go away. You’ve sprayed. You’ve medicated. You’ve vacuumed. But they just keep coming back. Just what are these nasty critters and how do you finally squash their stronghold on your home? Fleas are present all over the world. Over 2000 varieties, in fact. In America there are over 200 different types of fleas. 200! This will be no easy battle. Fleas are capable of jumping from 14 to 16 inches and will bite humans as well as your pet. Females can begin to lay eggs after just 48 hours of their first blood meal. The most common in this vast array of minuscule nuisances are the cat flea (Ctenocephalides felis) and the dog flea (Ctenocephalides canis). The most common parasite on your dog will actually be a CAT flea. Dog fleas are commonly found in Europe, while cat fleas are very common to the U.S. Cat fleas are not picky about whom they feed on. Cat fleas can, in rare cases, carry disease. Also, if ingested they can cause tapeworm. The cat flea has been found to carry the plague and murine typhus to humans. They can be brought into your home almost undetected to the untrained eye. They can attach to your clothing or to your pet. They are found in yards, kennels, forests, parks, or any other areas common to warm blooded animals. Why? Because this is where they can find the hosts needed for reproduction. Did you know the female flea can lay up to 50 eggs a day? That means in approximately nine months a female can create up to a trillion descendants! And due to their four-stage lifecycle they are extremely impervious to extermination tactics. So what can you do? How do you stop them? How can I tell if I have fleas? The first thing you need to do is look for flea feces. This will be small grains of what appears to be dirt. If you take this “dirt” and rub it between your fingers with a small amount of water and it turns red you’ve found your proof. This is because flea feces contains dried blood. The most common place to find it is on Spot’s belly, his favorite bed or any area that your pet frequents. These feces drop off and accumulate in recesses. Look closely and you will find it hiding in the soft under-fur of his coat or the deep dark recesses of his pet bed. This is where the flea prefers to lay its eggs because this is a warm fertile area. I have fleas, now what am I up against? Fleas prefer higher temperatures and higher levels of carbon dioxide. Some eggs will remain on your pet while others fall off, spreading the nuisance intruders’ stronghold. These eggs will develop into the second stage of the cycle, larvae, which will feed on these flea feces. These small worm-like larvae will most likely be deeply hidden from view. They are commonly found in the bottom layer of carpeting, pet bedding, or under furniture where they will shed twice before maturing. Here they lay and feed and grow undetected and undisturbed. Before they are detected they become pupae. These develop within a silk-like cocoon; this cocoon is extremely resilient. Inside this protective shell the nuisance insects can live for up to one year without feeding. This shell can protect the flea pupae from even some of the strongest flea defenses. This is why just when you think you’ve eradicated the problem and you’re free of the pests they seem to come back out of nowhere. They lay in waiting for a host to feed on. They are sensitive to vibrations. Once they sense a vibration they emerge to feed and perpetuate the lifecycle. The adult flea can develop and mature in nearly three weeks and live the adult stage for approximately 25 days. Now that we know who we are up against, how do we get rid of them? DILIGENCE! Flea Collars: The old stand-by method. Available almost everywhere. Moderately effective at keeping fleas off your pet and providing an unhealthy, un-welcoming environment in your pet’s fur. Be careful, as many have harsh and potentially dangerous chemicals, and their placement around the neck can lead to a serious compromise of the nervous system if improperly used or mixed with other toxic agents. Read package instructions for size and weight of your dog. Topical Treatments: My personal favorite. Available from your veterinarian or at your local pet store. A few carefully placed drops between the shoulder blades (to keep your pet from ingesting it) will protect Spot for quite a while. Common medications include Frontline® and Advantage® brands. Carefully read package instructions for your dog’s size and weight. Check package ingredients for effective chemicals listed below. Oral medications: Available through your veterinarian’s office. This product is noted for causing the larvae to become unable to reproduce, thus rendering an end to the flea's lifecycle. Flea Shampoo/Bathing/Dips: Another favorite. Getting Spot all scrubbed up will help ease his discomfort. It will also give you a better idea of just how bad your situation may be. Check his fur CAREFULLY while bathing. Try to remove ALL of the fleas you find. This may be an arduous task but will be well worth the effort. If prevented on Spot early enough you may be able to stop the infestation before it takes over your home too. Observe the bath water. If you find fleas are still alive in the bath water they are likely to re-infest your dog with a simple splash. Most flea shampoos only help remove the fleas from your pet’s fur. Find a shampoo that KILLS the fleas while shampooing your pet. Scrub thoroughly. Take your time. Be patient. When bathing your dog, follow these simple rules to get the most out of your scrubbing. Start at your pet’s head and work down. Fleas will instinctively move to higher ground. If you start at the head you have better control of the pests and are more able to keep tabs on how well you have eradicated the fleas. Continue by working your way from the head toward the back and the chest. You can use a flea comb as you scrub. Make sure to pull the hair in the opposite direction and work your fingers down to the bottom of the coat. This will help you see if any are hidden in his coat and loosen the possible eggs that lay underneath. Continue working in this fashion to the tip of the tail. Don't stop there. Go back to the head and check for survivors. If you find a few, start from the head and do it ALL again. Spot might be getting antsy by this point but it will be for his best. A few minutes in the tub will save him months of digging, chewing and scratching. Remember, taking your pet to have it “dipped” will NOT in itself eliminate a flea infestation in your home. You must treat your home along with your pet. Flea combs: Flea combs will only remove 10-60% of the fleas on your pet. While this product may seem like a good idea it only is relocating your problem. If you comb Spot indoors, the fleas simply jump to the carpeting or furniture. If you comb Spot outdoors, you are sending them out in the grass only to be picked up and brought back in later. Powders: Flea powders are convenient to use but they should be monitored. This type of treatment can cause dry skin on your pet. Some dogs are prone to dry skin and a powder may cause more harm than good. Powders have been replaced over the years with more sophisticated and effective methods. Let's say that we have Spot in tip-top shape now. Are we done? NO! You MUST treat your home along with your pet. Remember, through exponential growth, if he dropped just one flea it could turn into an infestation. So what do we do about Spot’s bedding? What about the carpeting? The furniture? Many items are available. You will need to use a combination of two things; an adulticide along with an insect growth inhibitor. An adulticide does just as its name implies. It kills off the adult through poisoning. The inhibitor interrupts the developmental stages of the cycle rendering the pest unable to reproduce. Foggers: These are the "bombs" you find at your local pet or discount department stores. They are somewhat effective, but unfortunately they miss the important areas. They usually do not reach the areas under your furniture and since they are commonly set off in the center of a room they miss the outlying areas. These also require you and your pet to leave your home during fogging. Sprays: Best for in-home use. These can be directly sprayed onto areas where you know there is a problem. They can be deliberately sprayed under furniture and beneath couch pillows, on pet beds, into floor cracks, behind curtains, etc. Read package directions carefully. Remember to keep pets and humans off sprayed areas until dry. Powders/Dusts: Some flea powders can be sprinkled into your carpets or pet bedding. Powders help fight the development of pupae into adults, thus rendering an end to the lifecycle of the flea. Follow package directions carefully. Ask your local pet store what brands they recommend. Read package labels under "active ingredients." Look for a pyrethroid. This is an insecticide that improves on the biological activity of natural pyrethrins. Pyrethrins are extracts of a species of Chrysanathemun, which acts on the insect’s central nervous system. They are regarded as relatively safe. This is a specific chemical used to kill the adult biting flea. Also look for permethrin. Another ingredient that is very effective is called an IGR (insect growth regulator). 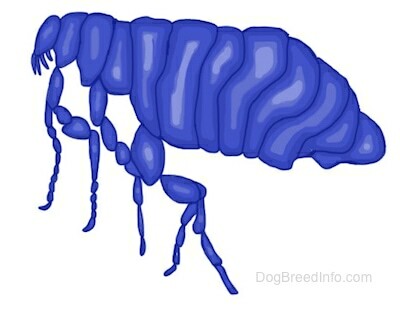 This chemical disrupts the normal developmental cycle of the flea rather than poisoning it. It is a very effective weapon in eliminating your pest population by stopping the reproduction cycle. They will be listed as methoprene or pyriproxyfen. These are also available through your vet’s office and pest control companies. Please keep in mind your pets AGE and SIZE. Do not use treatment for dogs on a cat. One of your best allies in this battle will be your vacuum. After applying these preparations to your home SWEEP, SWEEP, SWEEP! This will start the removal of fleas. REMEMBER to remove and burn your sweeper bag or put your sweeper bag in a plastic bag after each sweeping. This will keep them from returning to a cozy spot to reproduce. Vacuum thoroughly the areas where your pet sleeps or frequents. Pay particular attention to areas under furniture, along wallboards, close to pet bedding and area or throw rugs and cracks in the floors. You may not "see" that you are sweeping up fleas or eggs but it’s very likely you are removing feces and eggs/pupae. Remember that fleas are stimulated by vibrations. Your sweeper will stimulate the pupae to emerge, making them vulnerable to insecticides. Run the sweeper over your furniture and wash your bedding. Fleas are not picky about who they bite. If they find a warm host you too could be their next dinner. So what about flea bites? Do fleas carry disease? Flea bites can cause a few different types of irritation. The most common being itching. Your dog will most likely let you know there is a problem right away by his incessant scratching and chewing. Dogs can even sense a flea traveling on their skin. They can feel a tickle that lets them know where to dig and chew. Keep in mind that a flea has a voracious appetite. A single flea can nibble on Spot more than 350 times in a single day! Imagine being bitten again and again and knowing that it’s going to happen more and more. Your pet will become obsessed with cleaning itself, which can lead to hair loss and hot-spots, or allergic dermatitis. Rashes will make your pet vulnerable to infection and if left untreated can make your pet quite ill. A sick animal then becomes susceptible to anemia. Fleas can also transmit tapeworms to your pet. Ask your vet for his opinion on how to best treat tapeworm. Some will tell you to treat your yard also. This may not be possible for some due to the size of their yard. If you live in a home with a relatively small yard and this is the only area your pet frequents, it would be advisable to take precautions on your lawn. Spreading insecticides and mowing frequently should help keep the pests at bay. Those who live in more rural areas with a large lawn will less likely be able to take advantage of this tactic. As you can see, fleas are a lot tougher than they appear to the naked eye. Just remember to be diligent and patient. Most treatments to your home will take about three weeks to take a noticeable effect. It is much better to stop them before they get in. Once you have gotten them out of your home you must still remain watchful and keep up preventative measures. Without monitoring, fleas can take a serious hold on your home in the blink of an eye.